Delirium poses an interesting question - what would the USA be like if love was diagnosed as a curable disease? The "cure" - seemingly a partial lobotomy - is mandatory for all US citizens to receive on or around their 18th birthday. Removing the disease of love makes everyone pliant and docile, allowing the government to rule with a heavy, dictatorial fist. Lena is approaching her 18th birthday and can't wait to undergo the treatment. Not only is it a sign of adulthood, the treatment will also allow her to dull the pain of losing her mother early in her childhood. Everything is going smoothly until she meets a boy named Alex...and her eyes are opened about the truth of love and the government. I was not expecting to like this one as much as I did. 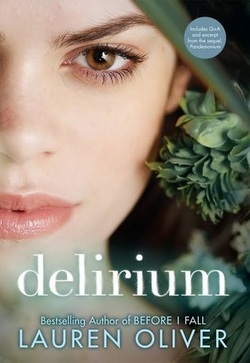 Well written and very readable, I sped through Delirium. The characters were very engaging and I am really curious to see where this story goes. That said - what a cliff hanger to leave the book on! If I had known it was going to be such a sudden end I would have tried to grab the second one so I could see what happens!